Synonymous with high-rise concrete, fry-ups and brash resorts, the Costa Brava is often overlooked by many a discerning traveller. Though this oasis of lush rolling shoreline, rocky cliff paths and up market fishing villages, is more like the idyllic Cornish coast rather than Blackpool, except of course with better weather. Racing over land in the twilight hours, the first glimpse of daybreak clutches the curve of the earth and lethargically spreads, causing the waning moon to vanish behind a sheet of light. Heading north from our Andalucian home, we push past misty plateau of row upon row of bare almond trees, which just months earlier had burst with blossom and life. The early morning December chill blows across the jagged peaks, lit up with candyfloss shades of pastel, as nighttime eventually gives way to dawn. Leaving the whispering presence of the mountains of Andalucia behind, daylight is met with the less interesting coastal shelf of Valencia, swamped in concrete and cranes. There is not just one Spain but many. The regions are distinct in culture and landscape. Catalonia is probably the most defined, proudly retaining an identity that borrows little from the rest of Spain. As you cross its border you can sense a difference; an air of confidence and prosperity hangs over the rolling hills. It is the Costa Brava. The Costa Brava is often snubbed, dismissed by many who believe it to be a brash stretch of multi-story concrete and English breakfasts. Although this was one of the first stretches of Spanish coast to be developed by mass tourism, the Costa Brava boasts many traditional fishing villages, encompassed by impenetrable forests of Mediterranean pine trees, sporadic clusters of wild flowers arbitrarily sprouting colour amongst the evergreen, rugged cliffs cascading down to rocky coves and coarse sandy beaches licked by crystal clear waters. In short, the “Brave Coast” is an oasis of rural tranquility and the vulgar “package-holiday” resorts it has become somewhat synonymous with are in a minority. Typical of this oasis are three of the most exquisite villages on the Costa Brava. Calella de Palafrugell, Llafranc and Tamariu and fortunately because of my partner’s parents owning an apartment in Calella de Palafrugell we are able to visit regularly, allowing us to break up the 2,500 kilometer drive from Granada to Cheshire. Having spent time in Calella de Palafrugell in each season of the year, early December is perhaps the most perfect time to experience the serenity and magnetism of the place. Blessed with blue skies, our walk to the utopia cove known as El Golfet beach on the southern side of Calella de Palafrugell was met only by a young Catalan, carelessly ambling across the empty white sands behind a dog excitedly exploring every rocky inlet and protruding pool. 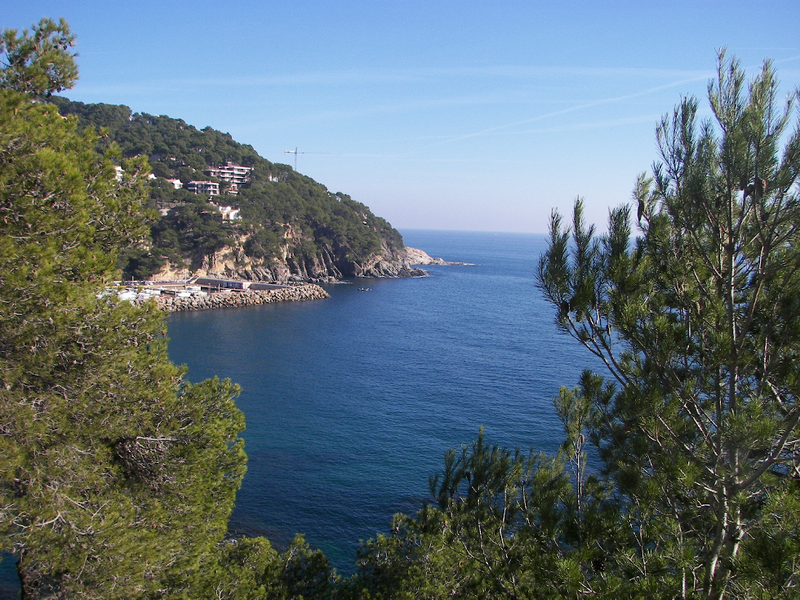 Without any true coastal road, the winding coastal path that traverses from El Golfet to Calella’s equally charming neighbouring town, Llafranc, is made from natural local resources, in keeping with the surroundings. The path steeply ascends pretty stone steps and descends around a string of coves with well-maintained mallorquinas (traditional fishing boats) orderly moored on the beaches. The whitewashed archways line the beachfront, bowing over the many elegant boutiques, bars and restaurants. In contrast to the simple white pueblo, the hillsides behind, stand rich and elaborate villas of rose, yellow and stone with impressive turrets and vibrant gardens, fringed by tropical cacti. Hundreds of tasteful terraces create magnificent vistas of the Mediterranean Sea and vertical, rocky cliffs of shimmering eucalyptus. Ivy creeps up the walls of the flower-banked apartments, many of which belong to affluent Catalans who escape here for the weekend. Nests of green are repeated in endless variations with neatly pruned privet hedges resonant of an English country garden. It is the well thought out, subtle architecture and the dependence on gardening and trees, which enhances the nature and beauty of Calella de Palafrugell. High above the secluded bay of El Golfet are the Jardins de Cap Roig, a cliff top botanical garden displaying a wide variety of plants and trees indigenous to the Mediterranean, alongside species from all over the world. The gardens were started in 1927 by an exiled colonel from the Tsar’s army and his aristocrat English wife. Development in this part of Spain has been low-key and low-rise, escaping mass tourism. By complete coincidence both my family and my husband’s family visited Palafrugell and its surrounding areas many years ago. Because my grandfather worked for Transfesa, a Spanish exporting company, he brought my father on holiday to Tamariu in the 1950s. My husband’s parents also came here in the 1960s, and fell in love with the place so much that they bought an apartment in Calella de Palafrugell thirty years later. On a recent visit to the area my Dad remarked how little had changed especially in Tamariu. Tamariu, whose name comes from the presence of many tamarind trees along the promenade, is a tiny fishing village and a secluded bay, emerging from a clearing of trees, north of Llafranc. The only real change my Dad noticed was the dual carriageway from Palafrugell to Calella de Palafrugell, which in the 1950s was a dirt track full of donkey carts. Even so, the dual carriageway is in harmony with the area, lined with trees and well-maintained gardens neatly trimmed in the central reservation. With the snow-capped Pyrenees dazzling in the distance, the journey out of Calalla towards Palafrugell is stunning. 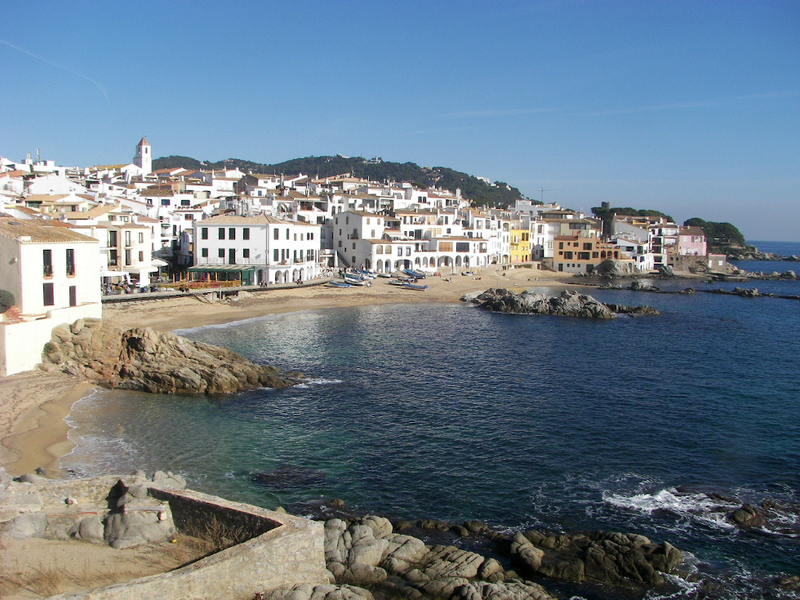 The town of Palafrugell, four kilometers inland from Calella, does not quite have the elegance and grace of the coastal resort, but does possess character, maintaining a cluster of old streets and shops around its sixteenth century church. The town’s famous son is the prolific Catalan writer Joseph Pla, who was one of the most popular Catalan writers of the twentieth century. What I really like about this area are the hectares upon hectares of peaceful paths and trials through wild flower meadows and shady dense woods, set back in the forested outback. These networks of paths connect between the coastal villages and inland towns and are ideal for walking, cycling and horse riding. We often take the bikes the scenic route to get to Palafrugell and Palamos without using the car, but be warned it is very easy to get lost. Palamos is a major port with one of the last remaining fishing fleets on this part of the Mediterranean coast, situated south of Calella de Palafrugell. Originally founded in 1277, Palamos has seen a rapid growth of tourism but its architecture has remained relatively unchanged. With plenty of good bars and restaurants surrounding the old port, Palamos has ample character and is well worth a visit. Many Spaniards often talk of “Las Espanas”. Spain would not be the same without the distinct regionalism it proudly possesses, and each region providing different and fascinating landscapes. Having lived in Andalucia for more than eight years, I have visited a lot of Spain. 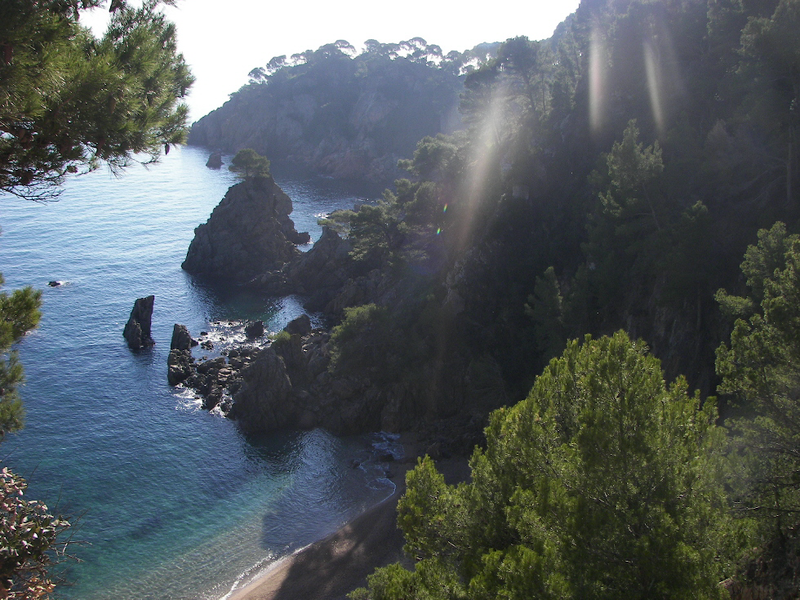 I love the vastness of the mountains and the gulch-like desert landscapes of Andalucia, but I have not come across any quite as beautiful a coastline as that of the Costa Brava. 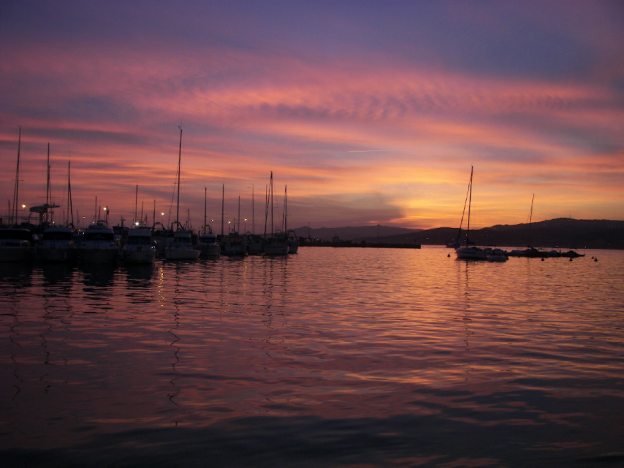 Twilight was approaching as we stopped at the harbour at Palamos. The evening was hazy and fuchsia-coloured, as delicate hues of purple slowly ran across the sea and sky, melting together like oil. The lights of the boats docked in the harbour winked back at the neon lights of Palamos, preparing for another evening’s activity. We were reluctant to leave this captivating scene, but as the final hints of colour were replaced by blackness, we continued our long journey north. This entry was posted in Travel writing and tagged Catalonia, Spain, Travel, Travel writing on January 1, 2018 by admin.